It’s a rare criminal who gets stopped by the police for knitting. 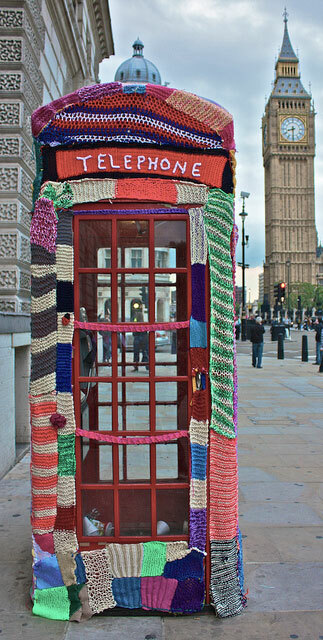 But that’s what happened in the shadow of Big Ben, where a covert London posse called Knit the City attempted to cover a Parliament Square telephone box in a knitted cozy, when two bobbies beckoned. Welcome to the quirky world of “graffiti knitting,” a global movement of several hundred artists dedicated to adorning otherwise stoic effigies of urban life–lampposts, statues, mailboxes–with knitted scarves, animals, and wraps. 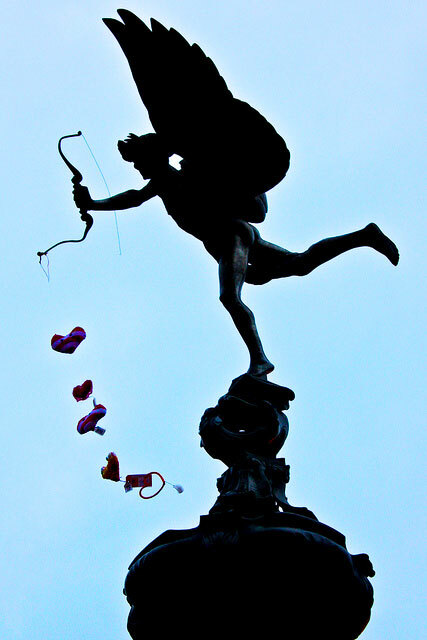 O’Farrell first made headlines when her group Stitch London, which conducts charity events, tied a 550-foot scarf around the lion statutes in Trafalgar Square in 2007. Two years later, she formed Knit the City to satisfy her sneakier side. Armed with code names like Deadly Knitshade (O’Farrell’s handle), the Fastener, and Shorn-a the Dead, Knit the City covered a car barrier in Covent Garden, which was covered by the BBC. It has since gone on to several other clandestine and commissioned projects, including wrapping a Royal Opera House ballerina statue in knitted characters from The Nutcracker, revamping a tube station with a knitted spider’s web complete with dangling insects and fairies, and creating a Valentine’s Day Hubbub of Hearts in Piccadilly Circus, an ode to Prince William’s and Kate Middleton’s April 29 nuptials. This small but growing network of good-natured subversives–also called yarnbombers–has spawned two books, Yarn Bombing: The Art of Crochet and Knit Graffiti (Arsenal Pulp Press), and Knit the City; a documentary short, Tightly Knit; and an upcoming unnamed documentary. London isn’t the only city to see its public landmarks get a homemade makeovers. Last Christmas Eve, Manhattan artist Olek braved 20-degree weather at 2 a.m. to wrap the Wall Street Bull statue in a crocheted pink and purple cozy. Knitting Iceland offers knitting tours of Iceland that include graffiti knitting sessions and participation. Japan got its first taste of graffiti knitting just last year when some wool octopi and Buddhas graced a subway and shrine. Graffiti knitting began six years ago with Austin-based artist Magda Sayeg–a math major-turned-self-taught knitter–whose street-stitchery has lead to commissions from galleries, universities, museums, and the recent SXSW Festival in Austin under the banner Knitta Please. She’s currently gearing up for a big installation at the Etsy headquarters in Brooklyn. 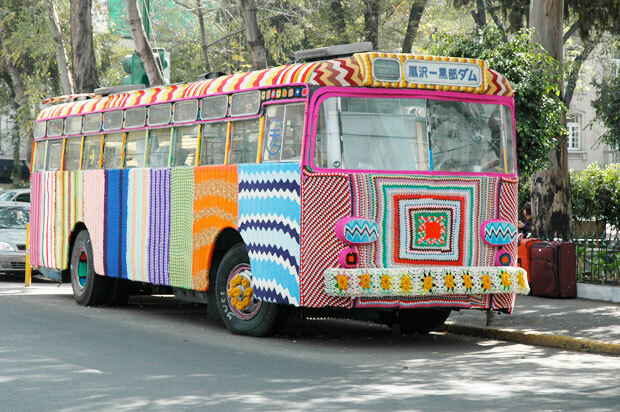 Yarnbombing attracts a smaller, but equally enthusiastic, population of male participants, with groups like Men Who Knit, HizKnits, and men’s knitting retreats. HizKnits founder Stephen Houghton, a San Francisco marketing director, sees more cultural than gender differences in yarnbombing approaches. “In the States, you tend to see more decorating or softening of hard objects,” he says. “I met a graffiti knitting group in Paris that had a more satirical take, using knitting to take humorous pokes at statues.” Holland-based Knitted Landscape spruces up Mother Nature–dotting the countryside with knitted rocks, tulips and mushrooms. Photos courtesy Knit the City (top) and Cesar Ortega (bottom).